Country singer, songwriter, author, actress, philanthropist: Dolly Parton is an icon of joviality, talent, and amazingly big blonde hair, and with Dolly Parton wigs, her biggest fans can sport her locks as well as her tunes. Dolly Rebecca Parton was born January 19, 1946, and in the past nearly six decades, she has become a fashion and style icon as well as a spiritual and fun singer, vibrant personality, and dedicated literacy advocate. Her stunning blonde hair is iconic in the country music world, and she does not hide the fact that she has been wearing wigs since she was 19. Dolly Parton's natural hair is a light brunette shade, not her characteristic bright whitish blonde with various highlights, and its texture is so light and fine, she found it difficult to style for the image she wanted to cultivate. Wigs, on the other hand, can give Dolly whatever appearance she desires far more quickly than endless styling sessions - a critical concern for a popular celebrity. She owns several different wigs and can change her hair style at a moment's notice without a lengthy visit to a hair salon or abusing her delicate locks with harsh chemical treatments. All lengths, from short layered bobs to long hair with sultry waves. Featured layers for body, texture, and height. Bangs to complement the layers and coordinate with the hair length. Assorted hair highlight colors, typically ash or beige tones to complement her skin tone. 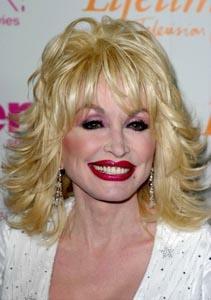 Many individuals have even credited Dolly Parton wigs with the celebrity's age-defying appearance. Unlike if she were to use her natural hair, a wig does not suffer the ravages of split ends, gray hair, or bad hair days. One thing all fans can agree on is that Dolly Parton wigs are impeccably styled and well-suited to her facial structure, complexion, and personality. While not all fans will be able to wear Dolly's bright blonde locks, they should take into consideration the same characteristics that make Dolly Parton's hair so perfect. Regardless of color or style, a wig that provides the same flawless look Dolly wears will have certain characteristics. The wig should be of good construction, preferably of human hair for texture, feel, and durability. The wig's hair style should be suitable for the wearer in terms of length, cut, and color. The wig should be of high quality and impeccable fit for a natural appearance. In the 1990s, Dolly introduced her own line of wigs manufactured through Revlon, and while they are difficult to find today, any high-quality hairpiece can provide the same stunning results as Dolly Parton wigs. Fans who truly want to imitate Dolly Parton's carefree style can find costume wigs of her blonde styles from reputable costume retailers. These wigs are typically synthetic and made only as a fun accessory, but they are a tribute to how popular this country diva's hair has become. Any reputable wig manufacturer can supply wigs of various shapes, sizes, and styles with the same quality as those Dolly Parton wears. To find wigs that mimic her popular blonde locks, however, it may be necessary to search for specialized retailers or custom wig makers because the styles that make Dolly Parton wigs so distinguishable are suitable for very few people.